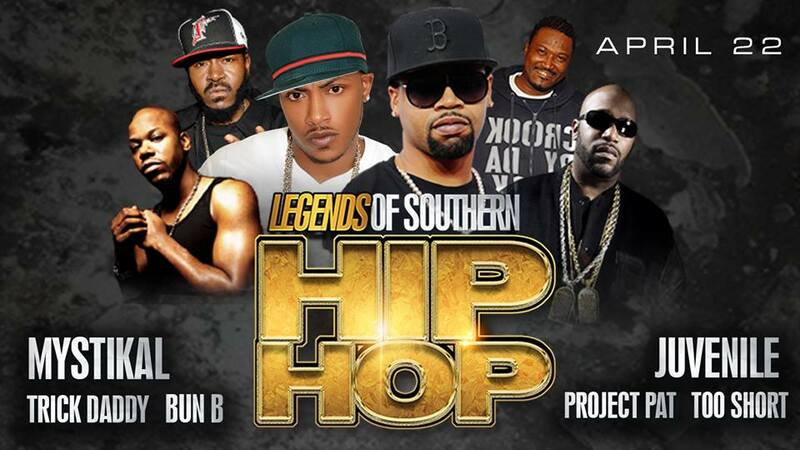 ﻿Published by Sareth Ney on Feb. 18, 2016 at 11:32 p.m.
JACKSONVILLE, Fla. – The Legends of Southern Hip Hop concert will be taking place at the Jacksonville Memorial Arena, on April 22. The concert will feature Mystikal, Juvenile, Trick Daddy, Bun B, Project Pat, Too $hort and more to be announced. New Orleans is where Mystikal calls home. His music career spans over 20 years and five albums including: “Mind of Mystikal” (1995), “Unpredictable” (1997), “Ghetto Fabulous” (1998), “Let’s Get Ready” (2000) and “Tarantula” (2001). To like Mystikal on Facebook, please click here. To follow him on Instagram, please click here. To follow him on Soundcloud, please click here. To follow him on Twitter, please click here. To subscribe to his channel on YouTube, please click here. Juvenile is also from New Orleans and his music career spans over 20 years too. His discography includes 11 albums and eight collaborative records. His latest is a 20 song mixtape, “Mardi Gras 2”. Visit Juvenile’s official website, by clicking here. To like him on Facebook, please click here. To follow him on Twitter, please click here. Trick Daddy originates from Miami. His music career spans two decades and it includes nine albums. Special guest features on his nine albums include the following hip-hop artists: Trina, Ludacris, Mystikal and many more. Like Trick Daddy on Facebook, by clicking here. To follow him on Twitter, please click here. Port Arthur, Texas is Bun B’s hometown. He is the co-founder of the duo known as Underground Kings (UGK), along with the late Pimp C. His latest album is called “Trill OG: The Epilogue”. Bun B’s official website can be accessed by clicking here. To like him on Facebook, please click here. To follow him on Instagram, please click here. To follow him on Twitter, please click here. Project Pat is from Memphis, Tenn. With his younger brother, Juicy J—they are both the co-founders of the hip-hop group, Three 6 Mafia. His music career spans over a decade, including eight albums. Follow Project Pat on Instagram, please click here. To follow him on Twitter, please click here. Too $hort hails from the city of Oakland, Calif., by way of Los Angeles. In the near future, he will be releasing his 30th anniversary album. It will be his 20th album to date. Please click here, to like Too $hort on Facebook. To follow him on Instagram, please click here. To follow him on Twitter, please click here.